Yes it’s an aircraft carrier. Let me explain. 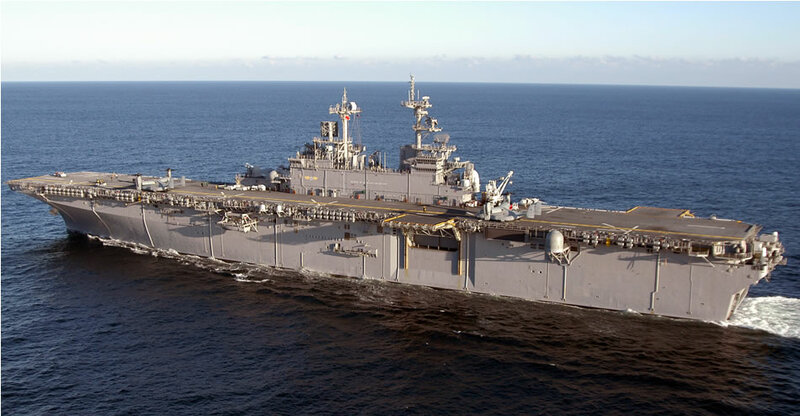 This carrier is known as an amphibious assault ship. It is used for landing an army from the ocean on to hostile shores. 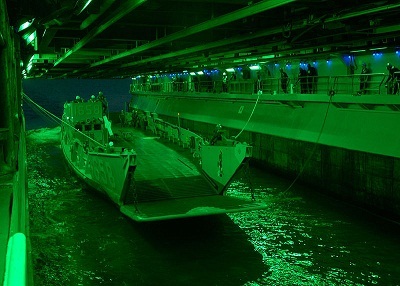 Landing craft boats can actually dock inside the carrier to load-up with tanks and trucks, while helicopters can lift off from its deck. There is also a hanger below for more planes and helicopters. These ships cost €590 million, which is less than our annual aid budget. The helicopters, planes and running costs would all add extra cost though. Click the links here and here for more information on these amazingly useful ships. Here is a cut away view to show its internal harbour and vehicle carrying capability. Click to enlarge. So while this ship is designed to invade hostile lands. It is also an extremely useful type of ship for offering emergency assistance to war torn or storm ravaged countries. Emergency supplies can easily be unloaded and brought ashore independently of whether working docks are in place. Helicopters can unload supplies further inland if roads are unusable. All the while a defence capability is available if the affected area is politically unstable e.g. Somalia. These ships have already been used for emergency relief efforts in many parts of the world, most recently after the tsunami hit Japan. However these ships would be even more capable if they were retrofitted specifically for emergency relief operations. The proposed Irish ship could be one such boat. 1. Less risk of fraud. The aid budget used for this ship and assets would be under the control of the Irish Governments with less risk of fraud. 2. Use at home. The ship would be available for use in emergencies in Ireland itself, e.g. winter flooding or maritime disasters. 3. Awareness. The ship would be a continual reminder of Ireland’s aid to foreign lands. By either its huge impressive bulk at a home harbour or on our televisions screens helping those abroad. It would be a boost for the morale of the Irish people. 4. Marketing. It would represent a great marketing tool for a small country like Ireland, and would counter the gloomy PIIGS stereotypes abroad. It could be announced as part of next years ‘The Gathering‘ celebration of the Irish abroad, and used as a lasting reminder of it. 5. Employment. The manning of the ship and associated disaster relief contingent on board her, would create much needed employment at home for the full time crew and nurture skills for any crew who were part time/ volunteers. I think this is worth considering and it would only require part of our yearly aid budget as the cost of the ship could be spread over many years. As this ship would only provide emergency relief we would still need to fund long term aid programmes. The running costs of the ship and support apparatus would need careful consideration. We could welcome donations and volunteers from the public and even the rest of the European Union to keep costs down. So first things first, any ideas on the name of such an Irish ship? And one last view of these ships, this one is from inside the internal dock/ harbour. Needed a little light relief this morning! The carry on of the financial institutions and the Government is so ludicrous thst this post may be actually within the realm of possibility. Rest easily, this idea wont happen. But if one of our celebrity economists suggested it we would probably have it in a year. The Irish Navy keeps the tradition of naming its vessels after famous women from Irish and Celtic mythology. I believe that this new ship should be named LÉ Isolde after Isolde daughter of the King of Ireland who married Kink Mark of Cornwall but really loved his nephew Tristan. After much tragedy and confusion both died of broken hearts. Any comparison to this story and the Irish banking crisis, EU bailout and our love affair with financial tragedy is deliberately intended!! That’s interesting, I had no idea the Irish Navy only called their ships after famous (and dead) women. The story behind Isolde is a bit depressing, like the banking crisis. With the money the Irish Government spent on the banks (€64 billion), they could have bought 106 of these aircraft carriers!! or covered our foreign aid for more than 100 years. Ireland should buy secondhand military goods from the US or Russia or make their own. Migs going for £20k a pop, that’s a bargain. The Irish Pilots just need to learn Russian. AK47s the cheapest most reliable gun ever and is still the most popular today in the majority of third world countries. This is a great idea, one I had proposed as an idea to the UK Government a while back. That the UK as part of the Commonwealth, should all put into a central fund to supply several of these ships for deployment to disaster relief areas, with fully equipped hospitals on board etc. I am glad Ireland has stopped aidto Uganda, a country that currently slaughters or imprisons gay people. They need to catch up to the 21st century morals before being granted “gifts” from the Western world. I think the aircraft carrier should be called ‘The Oak’ since she’d be strong like the native trees that surround out island. after a great Irish explorer.